You can never be in a forest and in a bad mood at the same time. She recently went off social media inspired by the digital detox idea introduced to her by NDNS. 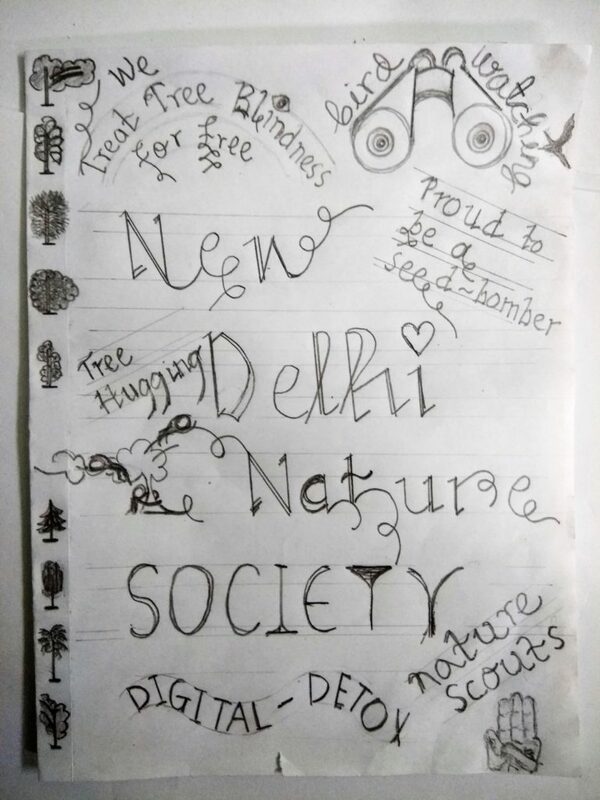 It was late afternoon when I received a message from Verhaen Khanna, the founder of the New Delhi Nature Society, inviting me to join him for nature activities the next day at Nehru Park, Delhi. 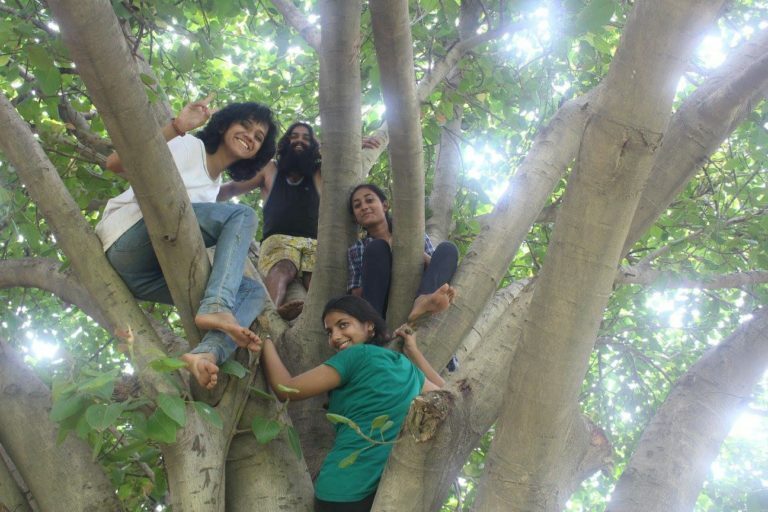 After a month of my gruelling final year MBA exams at the University of Delhi, hugging a tree was exactly what I needed. As I stared up at the sky through the tree leaves and branches above, my eyes softly started closing almost involuntarily. Lying atop the tree, I felt a strange calm fall over me. I first met Verhaen at the camping trip organised by him for the Perseid Meteor Shower in August 2016. I remember the day very vividly because it was super special and made to my list of top most-memorable days of the year. We started the day with a lovely nature walk, identifying birds and butterflies and collecting feathers fallen off of the peacocks and other beautiful birds in the vicinity. Next was setting up our tents and then building our very own rocket stove and feeding it dry twigs and leaves for our yummy chamomile tea that we cooked atop its embers. It made part of our organic and yummy breakfast. After feeding our well-deserved appetites, we climbed trees and spent the afternoon sleeping and playing atop them. That day I realised that trees make some of the very best friends. 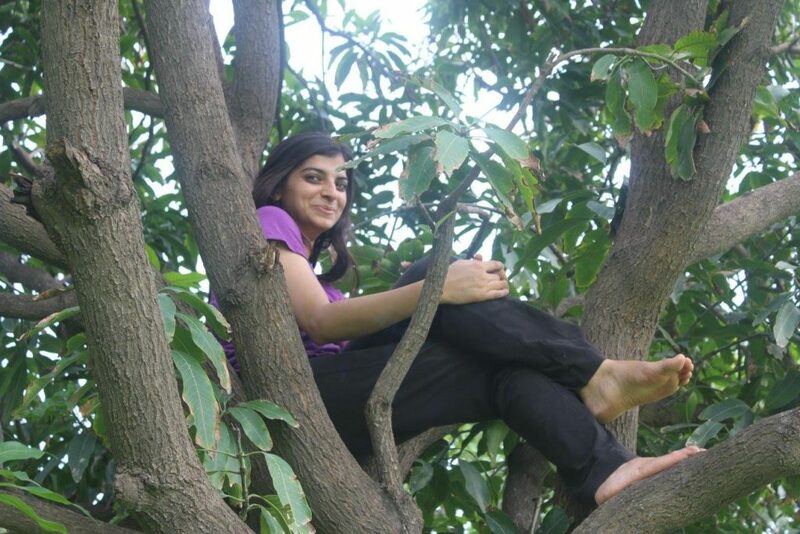 Its calming atop and amidst a tree and there was the feeling of tranquility we all long for in our oh so busy lives. A never felt before quiet fell over me and the ban on cellphones imposed on us for the day (or the “digital-detox” as Verhaen calls it) suddenly didn’t seem so bad. 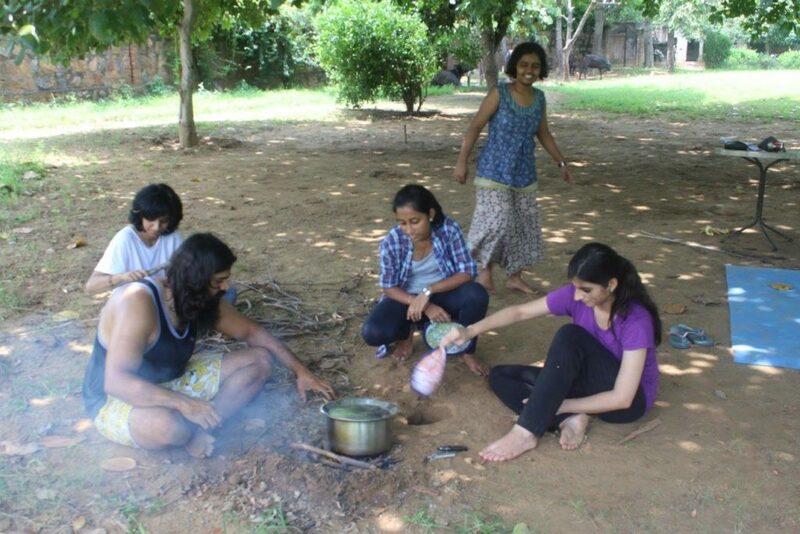 As afternoon turned to evening and we got hungry after all the tree-love, we gorged on a delicious lunch of rajma-rice and home-made pickle. 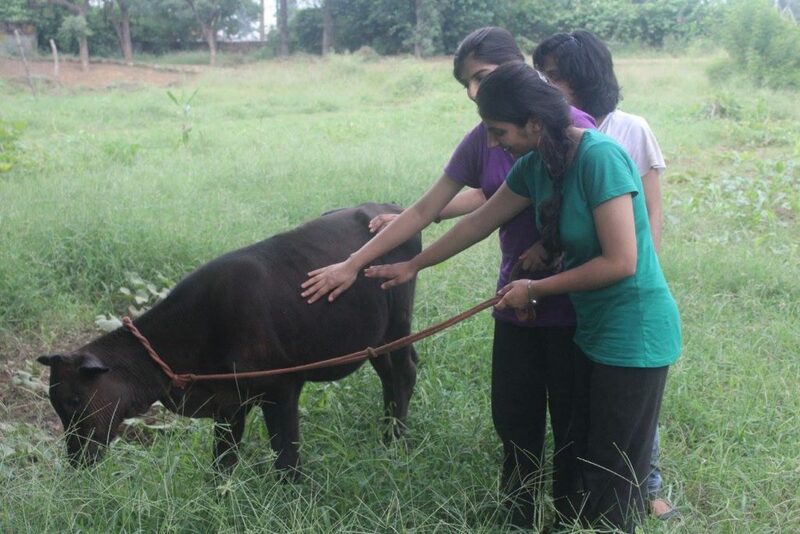 Then it was time for us to pet the cows in the caretaker’s shed and the calf that I tried to take on a walk, took me for a run instead :-P. It made for one of the funniest stories I have to tell and my fellow camping compadres had a good laugh. At sundown we practiced ‘silent-hour’ wherein we were supposed to stay silent for an hour. We could write, paint, hike, walk barefoot on the lush grass (this one is my favorite – A walk to remember ;-)) or simply lie under the sky or trees – basically anything except talk! Disconnected from my cellphone and computer, I connected with nature and it was definitely a tryst to remember. The next activity was sound-healing wherein we lay down on yoga mats and Verhaen played the guitar, djembe and other musical instruments he has designed and crafted himself. My mind felt relaxed in a way it hadn’t been for quite some time and I ended up falling into a light slumber towards the end. As night fell, we hogged on our dinner of freshly cooked parathas prepared by the caretaker at the farmhouse and then quickly huddled for a jamming session. One of the girls, Mariam knew some beautiful Mizo songs and my sister knew old Hindi film songs and we sang and played the musical instruments Verhaen had brought till the meteor shower began. I was so relaxed that after watching the first few shooting stars, my eyes closed involuntarily and I fell into one of the most beautiful sleeps I had in recent times. In the morning, I woke to the sound of birds singing. The whole week I was elated and there was a gleam in my eyes and a smile without reason that my friends kept commenting on. Little do they know that in moments of quiet, I escape to that day in my head and the unforgettable love-affair I had with nature. Lovely! An excellent job Verhaen! You are doing so much for the society!